​Reflections Gallery. It is a choice space devoted to changing exhibitions, reflecting the vitality and dynamism of contemporary Philippine art. The exciting plurality of various styles, themes and directions is singular proof of the Filipino artists’ genius, renewal and re-invention. Museo Orlina, in cooperation with the Embassy of the Czech Republic, presents “Blown-Away: The Allure of Blown Glass Art,” a presentation of the works of Czech glass artist Jiří Pačinek at the Reflections Gallery. Pačinek will be in town to give a lecture-demonstration at the Museo Orlina on the following schedules: Friday, Nov. 18 at 10 am and 2 pm for art practitioners; Saturday, Nov. 19, also at 10 am and 2 pm for students; and Sunday, Nov. 18, at 2 pm for invited guests and the formal opening of the exhibit at 3:30 pm, to be officiated by the Czech Ambassador to the Philippines, Mr. Jaroslav Olša, jr.
​“Blown-Away” runs till January 29, 2017. Museo Orlina is at Hollywood Subd. Rd., Barangay Tolentino East, Hollywood Subd, Tagaytay City. For inquiries, pls. call tel. nos: (046) 413-2581, 781-5918, 781-9471 and cell no: 0917-531-5108. Mischa showcases his relief-paintings with undulating surface evoking a cascade of drapery and laced with tangled webs and dribbled paint in. Misha’s “Resindipity” runs until November 13 at the Reflections Gallery of Museo Orlina. 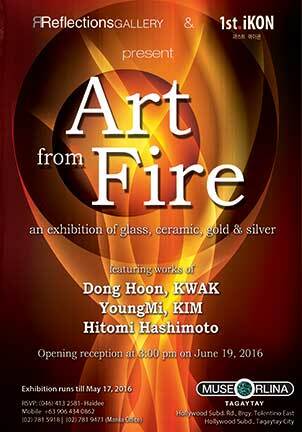 ​The Reflections Gallery is hosting its second exhibition in collaboration with 1st Ikon of South Korea called ART FROM FIRE featuring works forged from fire of DongHoon Kwak, YoungMi, KIM and Hitomi Hashimoto. 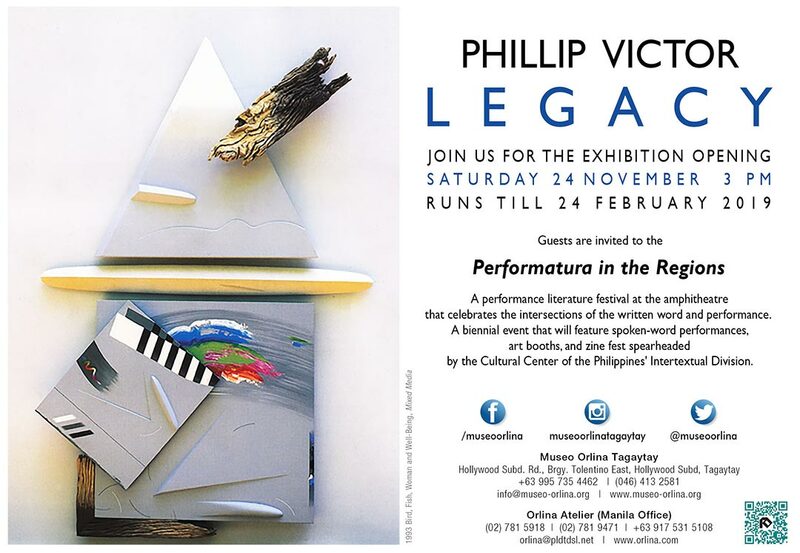 The mediums for these art pieces are rarely seen in the Philipines. They are varied and exciting from different materials such as ceramics, ceramics combined with cast glass and cast metals. Exhibition runs from June 12, 2016 till July 31, 2016. ​Collectors and lovers of glass art and glass sculptures are in for a special treat as Reflections Gallery at Museo Orlina in Tagaytay in collaboration with 1st. 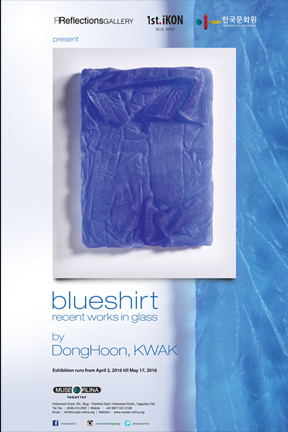 Ikon Gallery of Busan, Korea present the unique glass sculptures of a remarkable young sculptor DongHoon, Kwak in a solo exhibition called “Blue Shirt” that opens on April 2, 2016 till May 17, 2016. 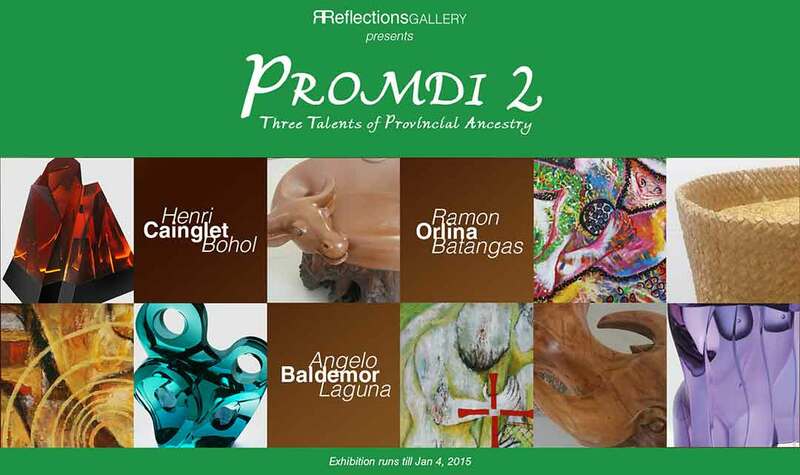 After a successful first showing of “PROMDI” at the Reflections Gallery of Museo Orlina in Tagaytay in January of this year, the gallery is ready to launch “PROMDI 2” on Saturday, November 22, 2014 with the opening ceremony at 3:00 pm. This time Reflections Gallery is proud to present a 3- man exhibition of Angelo Baldemor from Paete, Laguna; Henri Cainglet from Valencia, Bohol; and Ramon Orlina from Taal, Batangas. A group of Japanese and Filipino Women artists will showcase their works at the Reflections Gallery of Museo Orlina in an exhibit entitled “Gen/Ngayon 2”. Participating artists are Atsuko Yamagata, Lisa Ito, Aba Lluch Dalena, Kayo Nagata, Aze Ong, Mayuko Fukumoto, Sinag de Leon, Marie Ikura, and Charlene Bayani. The title of the show combines the Nihonggo word gen (現), which is roughly translated into “now”, “actuality” or “expression” and the Filipino word for now, “ngayon”. The exhibit will showcase interesting and diverse forms of art from installation to paper art, crochet sculptures and painting on textile by this versatile group of young artists who have been exhibiting and collaborating with each other. Gen/Ngayon 2 opens on September 14 (Sunday) at 3 PM and will run until October 31, 2014. Exciting activities are in store on the opening day at the amphitheater of Museo Orlina. There will be a live painting performance, a papercut demo and other art performances with live music to enthrall the whole family. A major sponsor of this exhibit is Twin Lakes, Philippines First Vineyard Resort Community in Tagaytay. 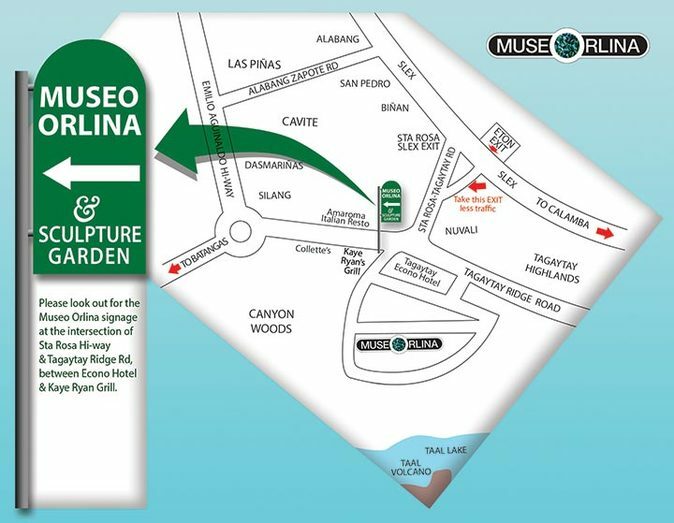 Museo Orlina is located at Hollywood St., Hollywood Subdivision, Bgy. Tolentino East, Tagaytay City. For inquiries, contact (02) 7815918, (046) 413 2581 or CP 0906-4340862.